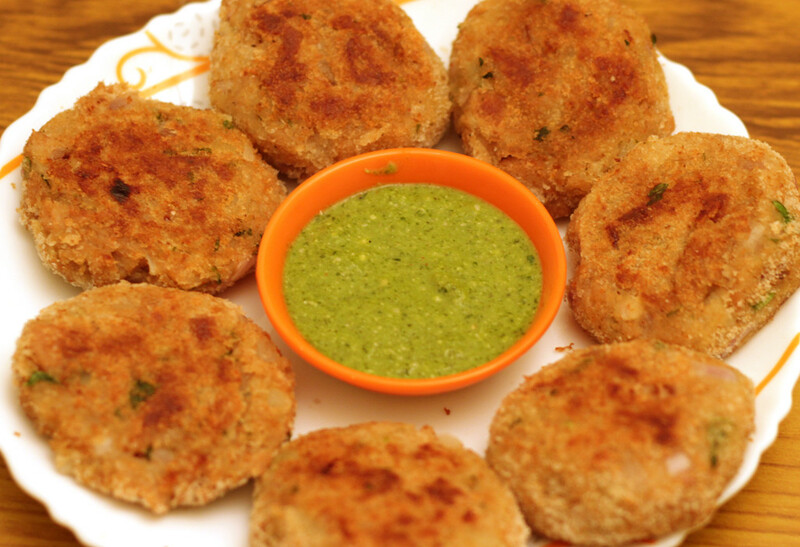 If you need a veggie healthy snack that kids will enjoy with no fuss, then this easy and quick soya chunk cutlets recipe are the perfect choice. Only organic products are used, and these are toasted in very little oil. Make a large batch and stock away in the freezer- then your tea time snacks can be prepared and served in a matter of minutes. Soak the soya chunks in water for about two hours. Then squeeze the excess water and keep aside. Place the chunks in a pressure cooker and cook upto one whistle. Then grind to get a coarse texture. Or else, you can place the raw and squeezed soya chunks in a grinder and grind until you get a semi coarse powder. Transfer ground soy chunks into a bowl and add the rest of the ingredients, except bread crumbs and oil. Mix well and shape into balls. Take each ball, flatten them and dip in a plate of breadcrumbs. Heat a flat pan, and pour a little oil in it. Spread it evenly and then gently place the soy cutlets once oil is hot. Let it fry until golden brown. Flip over and let the other side also brown well. Serve hot with tomato ketchup or green mint chutney. Your After School Snack: Healthy and Easy Soy Cutlets Recipe is ready to enjoy! For an extra crunch, you can also add toasted and chopped peanuts or cashewnuts in the mix and then fry the soy cutlets. Make cooking fun and healthy with this Easy to Prepare Soy Chunk Cutlets Recipe. The health risks of Soft drink consumption! !